Light and bright, yellow is the color of the sun and, therefore, of spring. After the cold winter, the mimosa appears with the first heat to replenish the muted environments with life. Its wide range of yellows is always the best choice to bring sensuality and joy to a subdued environment. Illuminates any room and makes the other colors shine, to which it complements elegantly. Calma House's most spring capsule collection had to be dedicated to mimosa and its yellow, golden and mustard tones. An explosion of light created to help your home to wake up from the winter cold. Original printed cushion cover, decorated with tassels. A sophisticated and elegant design, ideal to renew any environment. Exclusive 100% cotton stonewashed dhurrie floor cushion. Ideal to place on the floor or on pallets and create elegant corners full of Calma.Due to its volume, the final price of this product may vary. Original foulard for bed or sofa, with ethnic style prints. Beach towel in honeycomb fabric. Great absorption and fast drying. Its low volume and weight make it the ideal towel to carry always to the beach or the pool. Each beach towel Ola is sold with its own bag. Exclusive bedspread with soft touch, decorated with the artisan technique of tufting. Bring more life to your bed and your bedroom with this original Calma House design. 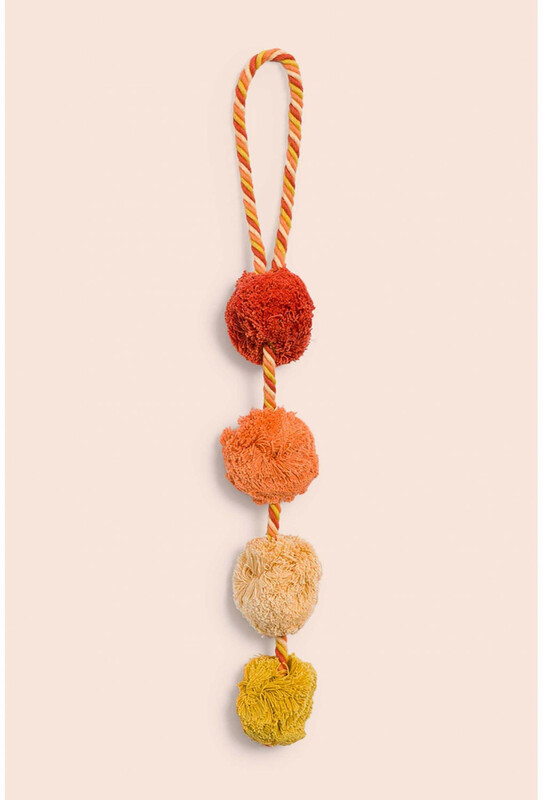 Original ornament made with pompoms. Original jacquard bedspread garnished with fringes. 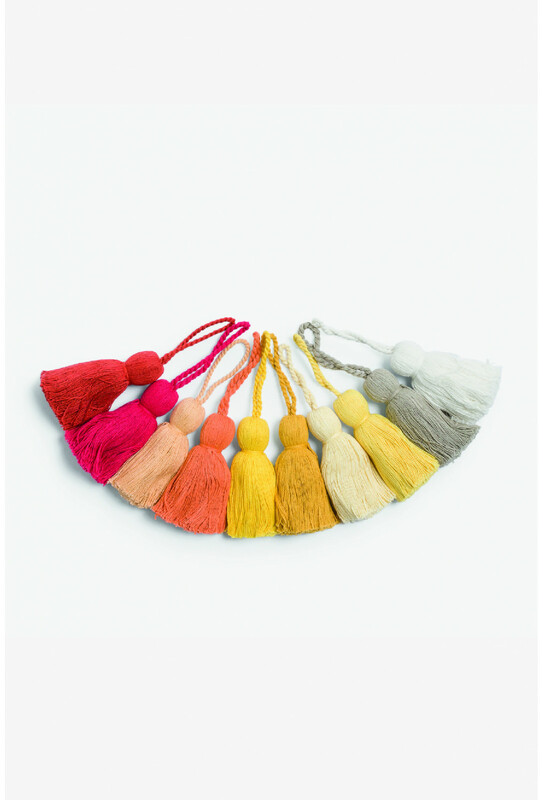 Pack of 40 tassels in orange, yellow and grey tones.Content: 10 different colors, 4 units of each color. Exclusive cushion cover made in durry fabric and stone wash finish. Ideal to give an ethnic touch to any environment. Made by hand and decorated with fringes. Exclusive pouf, handcrafted in durry fabric and with stone wash finish. Removable and washable cover.Due to its volume, the final price of this product may vary. Exclusive 100% stonewashed dhurrie cotton. Ideal to give an ethnic touch to any environment. Made by hand and decorated with fringes.Due to its volume, the final price of this product may vary. Table runner, made in durry fabric and stone wash finish. Ideal to give your table a unique and fun touch, and protect it from the contact of dishes, glasses or other objects. Striped hammam towel. Great absorption and fast drying. Its low weight make it the best towel to carry always to the beach or the pool. Each beach towel Cannes is sold with its own bag. Striped double hammam towel. Great absorption and fast drying. Its size makes it ideal to share, and its low weight make it the best towel to carry always to the beach or the pool. Each beach towel Cannes is sold with its own bag. Original printed throw, decorated with fringes. A sophisticated and elegant design, ideal to renew any environment placed on the sofa or at the foot of the bed. Original cushion cover decorated with the artisan technique of tufting. Exclusive sofa cover with soft touch, decorated with the artisan technique of tufting. Bring more life to your living room with this original Calma House design. Original jacquard cushion cover, garnished with tassels. Handmade. Original jacquard sofa cover garnished with fringes. Exclusive cushion cover made in durry fabric and stone wash finish. Ideal to give an ethnic touch to any environment. Made by hand. Original embroidered cushion cover decorated with fringes. Made by hand. Plain cushion cover, made of honeycomb fabric. An elegant design to transform any room of your home to your liking. Plain bedspread, made of honeycomb fabric. An elegant and sophisticated design to bring Calma to your bedroom. Plain sofa cover in honeycomb fabric. An elegant and sophisticated design to transform your living room into a space full of Calma. Original cushion cover, garnished with pompoms. Handmade. Exclusive cushion cover made in elegant vintage cotton. Chair pad elaborated with vintage cotton. Very comfortable and easy to combine.Due to its volume, the final price of this product may vary. Round chair pad elaborated with vintage cotton. Very comfortable and easy to combine.Due to its volume, the final price of this product may vary. Exclusive 100% linen cushion cover, in yellow.